A tooth has two distinct portions: the roots (which is surrounded by bone underneath your gums), and the crown (which is the visible part above the gums). A dental implant, made to mimic a tooth, also has a component within the bone (the fixture, or screw), and a component above the gums (the crown). 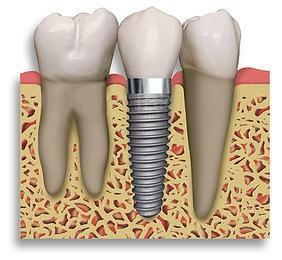 Hence, for a dental implant to work, there has to be sufficient bone for the implant screw to be sunk in. The bone provides the framework needed for the implant to be stable- if there is insufficient bone, the implant will not have enough support and will fail eventually. ‘Ideally, 10 mm of vertical bone dimension and 6 mm of horizontal should be available for implant placement. Placement at these dimensions prevents encroachment on anatomic structures and allows 1.0 mm of bone on both the lingual and the facial aspects of the implant. There should also be adequate space between adjacent implants. Take the above picture as an example. You can see that the tooth in the middle has been extracted. The wound has mostly healed, and we can see an empty space of gums. The bone underneath this empty space of gums is called the residual bony ridge. Over time, the width and height of this residual bony ridge will decrease, making it more difficult for us to place in an implant. In fact, the above picture is a good example showing how the width of the bone has shrunk over time. The imaginary black line shows how much bone there was originally. Over time, however, the width has decreased, leaving us with a smaller amount of bone. The residual bony ridge decreases slowly over time. The longer the time elapsed since your extraction, the less remaining bone you will have. This means that if you had extracted your tooth 15 years ago and are thinking of getting an implant only now, it may be difficult to do so. Of course, bone loss occurs differently between people and some are more lucky than others. You will have to visit your dentist for a proper consultation before a verdict is reached. The table below is a useful guide to show how time correlates with bone loss. This is not a definitive guide - it is merely an estimation. As you can see, bone grafting is not the only technique used when there is a shortage of bone to place an implant. In fact, it is only usually reserved for severe cases. In less severe cases. bone expansion and bone split techniques can be used. These are surgical procedures whereby the bone is deliberately split or halved. The implant is then placed in between the split bone. The split bone is then closed back together and left to heal. This artificially ‘expanded’ bone now houses the implant. These techniques take advantage of the inherent regeneration ability of bone. For example, when you fracture or break your arm, the bones eventually regenerate, heal and form back together. By performing a ‘controlled’ fracture of the jaw bone, we provide a space for the implant to be placed and hope that the bone heals around the implant. Bone grafting basically means the addition of bone to an area which is lacking. Bone grafting material can come from 4 sources: yourself (called an autograft), another person (allograft), an animal source (xenograft) or from a synthetic source (alloplast). Bone harvested from another site in your body, usually chin and jaw area, or from iliac crest. Allografts bone from another human source, usually cadavers. These donated bone are housed in a ‘bone bank’. They are extensively tested to exclude any transmittable diseases, and are processed and sterilized before they can be used. According to the Centers for Disease Control and Prevention in the USA, there have been no reports of disease transmission from allografts in the past 30 years. Hence, they have been deemed a safe option to use for bone grafting. Xenografts are bone grafts that come from animal sources. The two most commonly used xenografts are derived from bovines and porcines (cows and pigs). Again, risk of disease transmission with these grafts are negligible as they undergo a stringent selection and sterilization process before they are made available. Alloplasts are synthetic bone made for grafting purposes. They are usually derived from naturally occuring substances in our body like calcium and hydroxyapatite. Advances in technology have increased the success rate of alloplasts over the years and made it quite a popular choice. Which is the best material? Classically, autografts have been considered the ‘gold standard’. It has traditionally been used as the treatment of choice for bone grafting. With the advent of new technology, however, alloplasts have gained considerable popularity. It offers convenience and also avoids the need for a second surgery. It is difficult to give specific recommendation as to the best material to choose because every patient is unique. Every case is different and the final decision should always be made after a consultation with your dentist. Most grafting procedures are done under local anesthesia. This means that you will be fully conscious for the procedure, but you should not feel any pain during the procedure. An incision in made in your gums so that the underlying bone can be visualised. The bone material is packed into the site and may be covered by a membrane to aid in bone formation. The area is then stitched up and you will be sent home to rest. You will then be reviewed in 2-3 months time to see if the bone grafting is successful. What is the success rate for bone grafting? Not 100%. We hope that the body will accept and be receptive to the new bone. However, in some cases, the body views the bone graft as ‘foreign’. The bone graft material will not be retained and will be metabolized (or digested) by the body. After teeth are lost, the underlying residual bone gradually decreases both in width and height. Bone grafting has a higher success rate when it is used to increase the width of the residual bone. It cannot be used to predictably increase the height of the remaining bone. You will have to go for a dental consultation to determine the nature of your bone loss. In some cases, Xrays (like CBCT) may be taken to assess your situation.